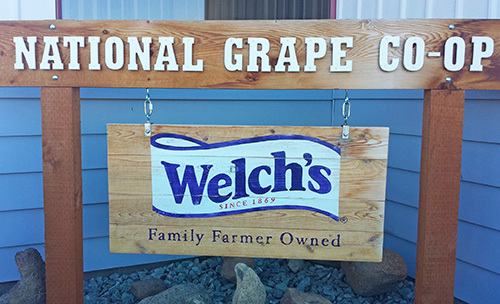 My trip to Washington State to take part in the grape harvest and tour a Welch’s juice processing plant was paid for by Welch’s. I was not compensated to write this post. All thoughts are my own. American Heart Month is coming to a close, though really we should be eating in a way to support heart health every day of the year. There are simple ways of doing that and drinking 100% grape juice made with Concord grapes is one of them. Many people are familiar with some of the heart healthy benefits of drinking red wine, thanks to the polyphenols it contains. 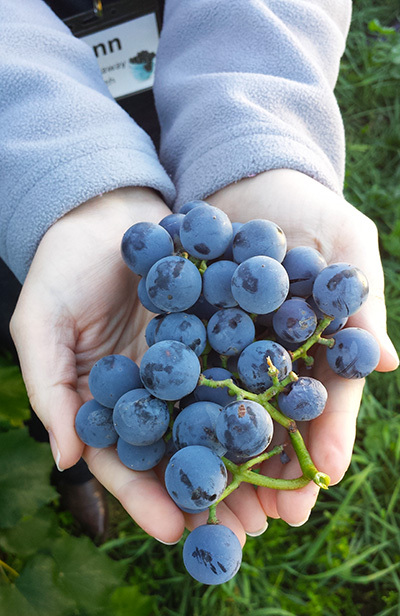 Concord grapes contain the same polyphenols, and it is only through the processing of the grapes into juice that we can reap the full benefits. Most people won’t eat the bitter skins or seeds, which is where many of the polyphenols are located. Also, heating the grapes during juice production helps improve our bodies’ ability to absorb the polyphenols. There is a great deal of research showing the heart healthy benefits of grape juice made with Concord grapes, including improved circulation. Juice is a staple in my house. A 4-ounce serving is equivalent to a serving of fruit and for many people, children included, it helps fill the gaps for those that might not otherwise eat enough fruit. While I would like to say that my children love drinking water, they don’t always, despite my best efforts. So I’m fine with them drinking a daily 4-ounce glass of 100% juice (and I generally add a little bit of water to give them a larger portion size and to help with hydration). I’d much rather them drink something with health benefits, such as 100% juice and grape juice in particular, than other choices devoid of nutrition. We first met with some of the Welch’s farmers who explained the harvest to us before riding on the grape harvester, which was quite loud and bouncy but so much fun to see this amazing machine at work. It basically goes down each row and shakes the vines so that the grapes fall off and then they are collected via conveyor belts and dumped into a container pulled by a tractor on an adjacent row. The harvest season is short, only about a month long, but this machine makes it possible to harvest more land in a short amount of time. 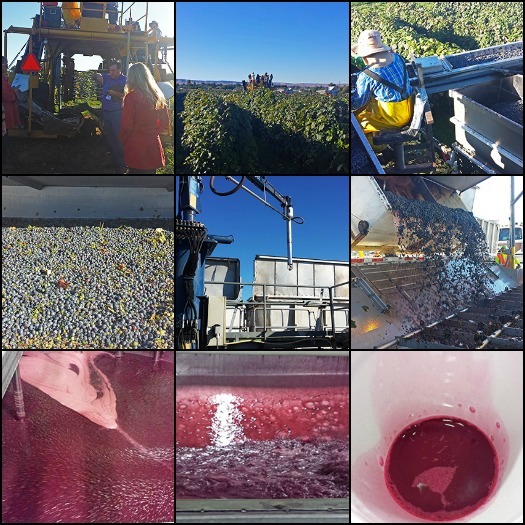 Then we went to a nearby processing plant and watched the loads of grapes coming into the plant. 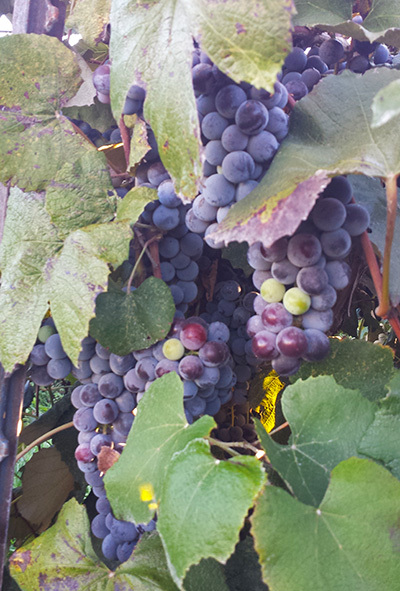 All grapes are first tested to ensure that they are within a tightly controlled sweetness range. Next the grapes are dumped and transported into the plant where they go through a number of processes of heating, straining, etc. to finally become juice. Tasting it straight off the line was amazing. Grape juice is actually quite versatile besides just drinking it. I’ve always used it as a base for homemade fruit popsicles in summer, but I’ve never actually cooked with it (other than the fermented variety, of course). On the trip, Robin Plotkin made a wonderful Mediterranean Quinoa Salad using grape juice for the quinoa cooking liquid. And these Grape Glazed Carrots look like a fun family-friendly way to boost flavor and encourage my children to eat more vegetables, which is a bonus in my book. Eating for heart health can be delicious and something the whole family with enjoy. How do you eat for a healthy heart?